What is the enlighten™ Skin Toning Laser Treatment? 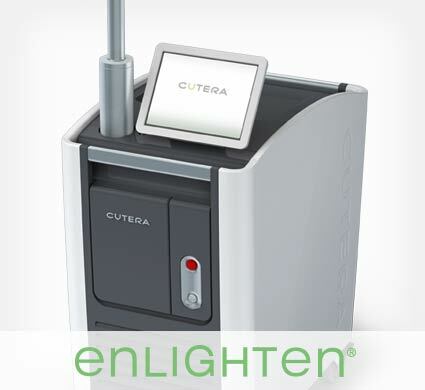 enlighten™ by CUTERA® is an effective laser procedure that achieves dramatic results in evening out skin tone and reducing unwanted pigment. The enlighten™ skin toning device uses shorter pulse durations and higher peak power to effectively shatter pigment particles without causing damage to the surrounding tissue, resulting in clearer, brighter, more even looking skin. How Does the enlighten™ Skin Toning Laser Treatment Work? When the the enlighten™ skin toning device is gently swept over your skin’s surface, the unique multiple wavelengths of 1064 nm, 532mn, and 670mn are delivered in ultra-short pulses under your skin, causing an intense photomechanical disruption that shatters the pigmentation, helping to induce the remodeling of your skin that leads to a brighter, more uniform complexion. Q: Does the enlighten™ Skin Toning Laser treatment hurt? A: The treatment is not painful and does not require any anesthesia or medication. When the device is passed over your skin, you feel a heating sensation that is common to most non-invasive laser treatments. Q: How long does an enlighten™ Skin Toning Laser treatment take? A: The actual enlighten™ Skin Toning Laser treatment requires no more than twenty minutes. Q: How many sessions will I need before I can see results from an enlighten™ Skin Toning Laser treatment? A: For most patients, full results are seen after 3 enlighten™ Skin Toning Laser treatments. Q: Are there any side effects from the enlighten™ Skin Toning Laser treatment? A: Immediately following treatment, you may feel some mild redness and swelling.